You have dozens of options for the type of stone to choose for your tile flooring. Add in the different colors, patterns, and shapes available and you have thousands of options for designing the flooring in your home. Travertine comes in sandy and earthen shades that complement the Arizona landscape perfectly. It can range from a pale yellow or beige to a darker tan. The striations in the stone combined with the colors make the tile look just like the rocks you might find in the desert. When the tile is sealed and polished, it has a glossy sheen that gives it a sophisticated look almost like marble. The natural variations in travertine give you more options for decorating. You choose a darker color and more matte finish to achieve a rustic look, or you can choose a lighter color and a glossy sheen for something more sophisticated and luxurious. That flexibility makes travertine a good choice for inside or outside your home. Travertine is essentially limestone, but it is special because it is hardened by its proximity to hot springs. The stone is harvested as is, and no chemicals or aggregates are added to it when creating the tile. The stone is also readily available and renewable. Travertine is eco-friendly because it sustainable and it doesn’t come with nasty chemicals that can harm the environment. When you choose travertine tile for your Phoenix home, you can feel comfortable knowing that you are making a good choice for the environment. Limestone isn’t known as an especially hardy stone, but travertine tile is very durable thanks to the hardening that it undergoes. The material itself can last for hundreds of years if you take care of it properly. It does not scratch or scuff easily, and stains can be lifted by professionals who are experienced in travertine tile floor cleaning in Phoenix, Arizona. Travertine is porous, so it is prone to water damage and staining if it is not sealed. You can use travertine outside confidently, but you will have to stick to a proper maintenance schedule to protect its long life span. Travertine may have enough hardness to prove durable, but it is relatively soft compared to other stone, which makes it easier to cut. 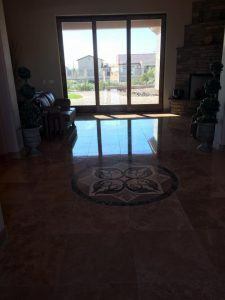 Phoenix homeowners prefer travertine tile for flooring because it can be cut and installed quickly, which saves them money and allows them to get the remodeling or restoration work they want done quickly. 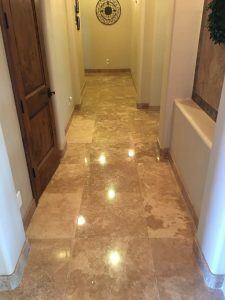 Perhaps one of the biggest advantages of travertine tile flooring for Phoenix homeowners is how easy it is to maintain. It only requires regular sweeping and occasional mopping to keep it free of dirt and debris. Cleaning up spills as they happen can prevent stains from setting in, and keeping the floors sealed can prevent water damage. Part of travertine tile cleaning in Phoenix is to not only know what to do but also to know what NOT to do. That includes never using harsh cleaners (including bleach, vinegar, and ammonia), abrasive cleaners (like scrubbing powders), or scrubbing brushes. Using any of these can etch or disfigure the tile or the grout. A mild cleanser is all that is needed, or you can use a basic steam mop with just water. Travertine is the perfect choice for your tile flooring. 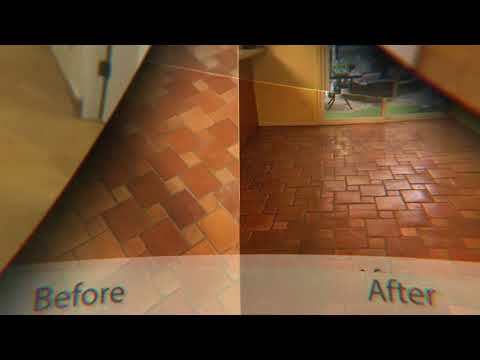 If you fall behind on maintenance or if your tile has become a bit dulled from the passage of time, you can call a tile floor cleaning company in Phoenix to restore the luster of the stone and make the floors look as good as new again. Americhem, LLC offers professional tile floor cleaning services, as well as repair and replacement of travertine and other tile flooring. Our experienced professionals know how to get results, and they can restore the beautiful colors in your tile flooring, refresh the grout, and give your floors a luxurious shine. Call to get a free quote on travertine tile floor cleaning or find out about our other tile floor cleaning services.